5. 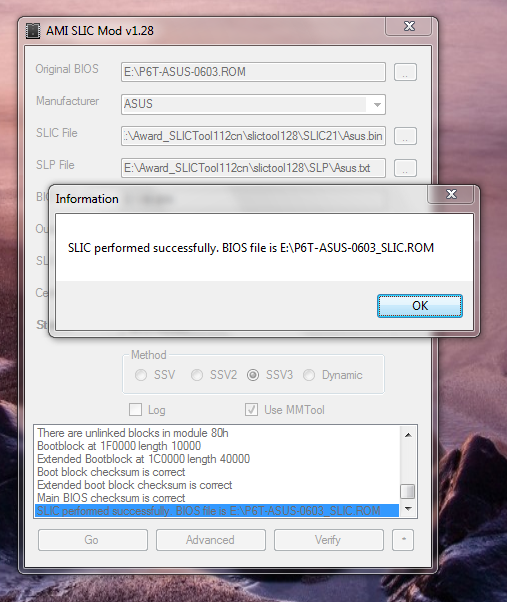 Press "GO" and wait till this "SLIC performed successfully"
6. You can press "VERIFY" but all should be fine. 7. now flash your "SLIC Bios". Please ignore my ignorance, but what is this for exactly? if i'm not mistaken m8, it's for inserting the oem information into your motherboard bios. dell asus etc. no need to use loaders and cracks for vista or win 7 then. it will just automatically activate them. Is there not one available for Award Bioses Rap? And yes award bioses can be done..
Can't seem to get the Slic Tool v1.2 from the above link and other places I've tried have all had the file removed? Any other places I could try? 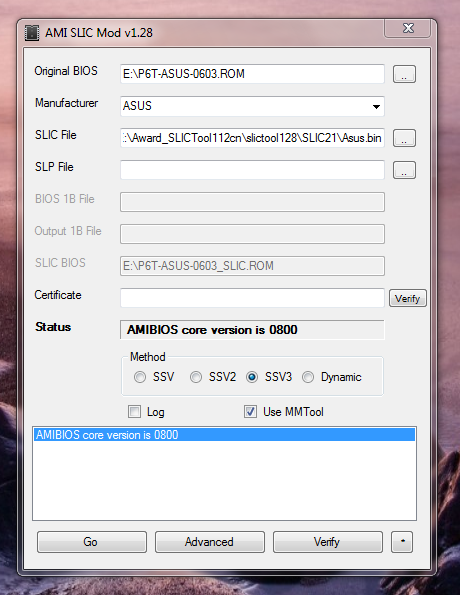 i downloaded the amitool133 software, and downloaded my bios.rom file, but i cant find an Asus.bin (SLIC21) file. i have the slp and the certs. anyone help me find them? should they come with the amitool? I've got a couple of the Windows 7 OEM disks (and haven't yet installed) - does this mean I need to frig the bios? I'm sure a couple of my mates have installed it on any old boxes and it seems to work for them? "Boot Block in file not loaded"
Had a look but i'll need more info on the motherboard to get the right flash.exe, I would look at the board manufacturers site for a bios flash program that works in dos, was the bios you modified taken from the board makers site or a mb bios dump ? Last edited by XBOX4LIFE; 6th November 2009 at 06:40 PM. AMI has an embedded recovery technique in the 'boot block' of the BIOS. In the event that the BIOS becomes corrupt the boot block can be used to restore the BIOS to a working state. The routine is called when the 'system block' of the BIOS is empty or corrupt. The restore routine when called will access the floppy drive (1.44Mb floppy disk drive) looking for a file named AMIBOOT.ROM. This is the reason the floppy drive light comes on and the drive appears to be in use. If the file (AMIBOOT.ROM) is found it is loaded into the 'system block' of the BIOS to replace the corrupted information. To restore your BIOS copy the most recent version of your motherboards BIOS file to a floppy diskette and rename it AMIBOOT.ROM. The diskette does not need to be bootable or contain a flash utility. It will access the floppy from 2-5 minutes the system will beep four times. Remove the floppy diskette from the drive and reboot the computer. if when you turn on the system it does not try to access the floppy, press and hold the 'CTRL' and 'HOME' keys at the same time. This will force the system (assuming the 'boot block' isn't corrupted) to access the flopy and look for the AMIBOOT.ROM file. 3. If no floppy access occurs press and hold Ctrl-Home to force update. Follow insructions on the screen and it will read the AMIBOOT.ROM file and recover the BIOS from the A drive. 4. When 4 beeps are heard you may remove the floppy disk. Last edited by XBOX4LIFE; 6th November 2009 at 06:55 PM. manage to flash it using the EzFlash program and i grabbed a pre done slip file. now im running fully registered OEM windows 7 ultimate. only problem now is its an old flash file and not the newest. if i was to re-flash the bios with the latest firmware would this remove the 2,1 table? I'm trying to do this on a Toshiba. 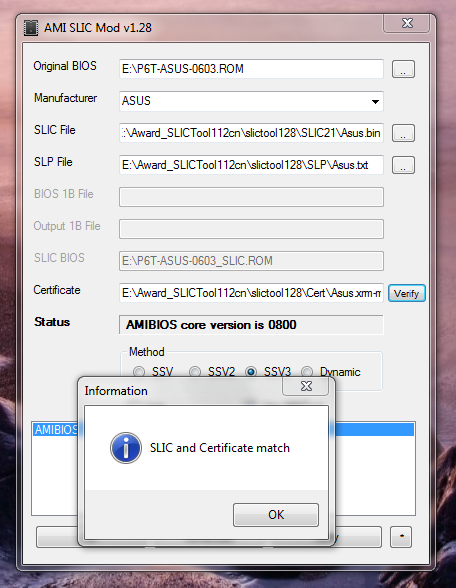 I have downloaded the the original bios and the modified bios and I have AMI Slic 1.41. I am a little confused as what to do next as in the manufacturer list there is no Toshiba? Any help would be great! I then downloaded the original bios from Toshiba, replaced the original with modded bios and flashed. 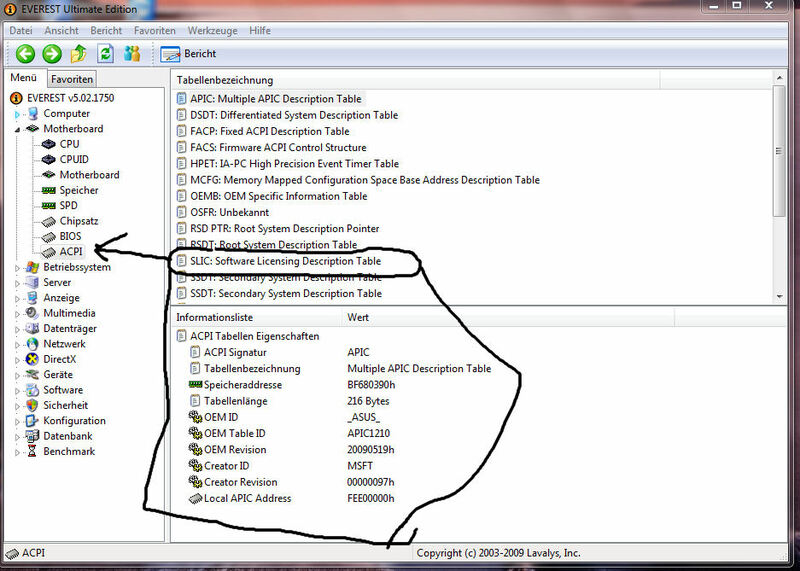 Then I got one of the OEM codes off the above site, went and activated and BINGO - we're laughing!